Looking to have some fun this summer? You aren’t alone – most people wait all year for summer to arrive so they can get outside and enjoy recreation with family and friends. 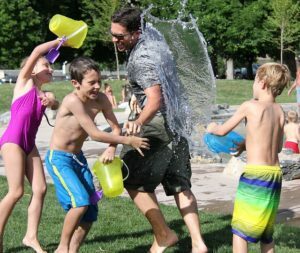 Unfortunately, that fun doesn’t always come free, as there are frequently costs associated with summer activities. So how do you make sure that your family doesn’t go broke while trying to enjoy the summer? Free summer activities are a great place to start. The list below includes seven ideas for free and enjoyable summer activities. Most kids love the outdoors, and fresh air is good for adults as well. Look for hiking trails in your area which are free to use and pack up the family for a fun day outside. You may need to purchase a few supplies before getting started – such as a backpack and appropriate shoes – but you can use those items over and over again. If your kids can’t wait to get out for a camping trip, consider pitching a tent in the backyard for a stay-home night outdoors. As long as you have a suitable yard in a quiet neighborhood, this can be great fun without costing you a single penny. When the weather turns sour, you may need to find something to do indoors. Check around with your local museums to find out if and when they offer free admission days. Or, at the very least, find ones which are affordable and offer free entry to kids. The parks system offered by your city or county is a great way to get outside during the summer months. You should be able to find a list of parks and amenities on the website of each local municipality. Kids are great at being creative, so you should be able to have fun even if the park is little more than some open space. Many cities put on events during the summer months, such as outdoor movies or festivals based around a specific local theme. Check the calendar for events in your area and consider getting involved. Whether you decide to volunteer or just attend when the event takes place, your family could use this time to have fun without dipping into the budget in any significant way. Adults and kids alike can get into the fun of playing sports, especially when those sports are free of charge. As long as you have a park nearby, you should be able to find places to play soccer, baseball, basketball, and more. Most people today lead busy lifestyles which offer very little in the way of downtime. When you do get some time to just spend with your family, don’t feel compelled to go out and do something – consider just staying home. You will be surprised at how many things you can find to do at home, including watching movies, playing in the yard, cooking together, and more. There are lots of ways for the whole family to have fun this summer. If you find yourself with spare time, give one of these free summer activities a try. What are your favorite free summer activities? What do you do for fun with your family? These are great tips John! We particularly try to take advantage of the local parks here. We have some nice ones and a single, low-cost, annual pass gets us into all of them – even when they hold events. It’s a great deal.